Jorge Luis Borges entered the Pedmonte Restaurant on Avenida de Mayo with the stiff steps of the unseeing; his face jutting forward to sense what the eyes could not see. It was August 23. Borges was eating out to mark his eighty-third birthday. The eating-house, traditional to politicians and the intelligentsia of Buenos Aires, was packed. A few faces looked up to notice the entrance of the maestro of Latin American letters on the arm of his secretary. A few works before, the Foreign Minister who had conducted Argentine diplomacy throughout the Falkland Islands crisis had entered that restaurant swinging his game leg and walking cane in a slow hopscotch on the patterned tile floor. He had received a standing ovation from the patrons. Jorge Luis Borges was noted not applauding. The exception was committed by one fat man, a journalist and broadcaster, one of those men who seem to know everybody in Buenos Aires, Chango Mendieta. He moved his gigantic form draped in a poncho away from the bar and with the joyful laughter of fat men, so loud it cracked wine bottles, he embraced Borges and the secretary in one vast fat swing. After they had disengaged, exchanging saludos to acquaintances in common, one or two people went to Borges to greet him respectfully. Not many; Borges was in the dog-house. He should be accustomed to that by now. He might even be suspected of taking a little pleasure in the abrasion caused by his remarks – though his friends worried that his contrary views and unpopular statements have lost him his chance to win a Nobel Prize. But to win a Nobel Prize writers need the support of a government or of a noticeable sympathetic group. At the very least they need myths and vary-tinted anecdotes about their persons as had Pablo Neruda, or Miguel Angel Asturias, or even Gabriel García Marquez. Borges has never had the official support, at any rate never for long and the myths and in his writing not in his curriculum. Of course, he kept on making those silly remarks. In 1972, in La Nación he expressed his anti-Peronism in ultra-montane terms and the Left called him an unreadable reactionary, or reactionary and unreadable — it does not matter in what order, but they called him both. In 1976 he said that the generals who led the coup in March against the Peronist government were gentlemen. In 1978 he caused a small wave – well, maybe a big ripple – of nationalist indignation when he said that ‘A war between Argentina and Chile would be a crime … madness …’ just as Argentina seemed to burst with euphoria and the military administration warmed to the idea of war with Chile for three freezing islands in the southern Beagle Channel. Now he was in trouble again. In March he had said that he saw no sanity in a battle for the Falklands. A poem that coincided with is birthday, a short poem published in the newspaper Clarín has become Borges’s epitaph for the Falklands and for two soldiers, Juan Lopez and John Ward. ‘They might have been friends, but they saw each other just once , / and each was Cain, and each one, Abel. / They buried them together. Snow and corruption know them. / The story I tell happened in a time we cannot understand.’ Such soldiers suit Borges’s sense of the timelessness of human stupidity and political sensibility. Later Borges would remark in the casual manner in which he usually made loaded political statements, ‘not all of us Argentines are demented. We are not accomplices’. Borges is often reported in casual conversation alone, when he emits opinions that the writer Borges would surely revise or not record. He has expressed his distaste for being recorded as a generator of political statements. He describes himself as without politics, an ‘enlightened conservative’ or pacific anarchist without loyalty to groups – though he was once a member of the Argentine conservative party for a short time, for a long weekend or something. It was not difficult to gain the impression that Borges knows that the public awaits his views, casual remarks, wisdom or wisecracks, with mischievous anticipation, even if people will hesitate to admit that they enjoy his debunking of figures and issues. As with other repressed communities Buenos Aires prefers to enjoy his folly — like his writing — privately. Borges sat down to a birthday supper with six Spanish journalists. The story I tell happened at a breakfast with Borges. At ten o’clock on the morning of Friday, 11 June 1982, three days before the Argentine surrender at Port Stanley, the sound of a bell somewhere in the flat could be heard on the landing. The Pope had just arrived and I had to file a story on the visit, the first ever of a Pontiff to Buenos Aires. But Popes there are many, they come and go. The Falklands Islands dispute was two and a half months old, at least this chapter of it, and was dragging on. Borges there is only one and opportunities to sit with him in quietude are not many. I apologised for taking his time which he might have devoted to listening to the radio reports of the Papal tour. ‘My time is largely empty … I am an old man. Most of my friends have died. I know a few people; I have a few friends also … Buenos Aires is a big city and tends to divide people. ‘What I would like to say is that all my people were military. My grandfather was colonel who married an English lady … War to him was something natural. Our conquest of the West was called the Conquista del Desierto. Before that a great-grandfather fought in the war of independence … Another took his troops across the Andes … with the advance of General San Martín. They were all military men. But I am a pacifist. ‘A very fine translator of Anglo-Saxon elegies, Gavin Bone, wrote that kings looked best in the past. And I say not that wars also looked best in the past. Borges has granted so many interviews that his comments have a tendency to be repetitive. His preferences are the same, his views do not after basically – his politics are conservative – his recollections are the same: of military forebears, of his mother who died aged ninety-nine, of his father’s library of English writers, of school in Switzerland, of the arrest of his sister and mother by General Juan Perón, of his own demotion by Peronism from librarian to municipal poultry inspector, of his anti-Peronism , of Buenos Aires and tango, of his death foreseen, of his passion for Old English which began in 1955 when he was reinstated and promoted to director of the National Library, and of his Saturday-afternoon studies of the ancient language. Perhaps because he has been shut in by darkness his experiences are of the imagination. Those events that were physical and common to ordinary people have become memories that are not up-dated, but are reiterated in conversation, and those memories he cherishes have attained a special embellishment of fantasy. It was raining quite hard. A remark about the weather was in order so I said that I did not know if the heavens were crying for Argentina or for the Pope. he munched noisy on some corn flakes. ‘I don’t suppose that the umbrella would be much use with God. It would be more like millions. ‘Do you means millions or many?’ Borges asked. I confirmed my belief that it would be millions. ‘Really?’ he asked with mischief. ‘I thought that was just a mistake. As when you say forty winks you do not mean forty, you mean many. My grandmother used to say ‘I’ll have forty winks.’ She meant a nap. This is an old-fashioned expression. He spoke slowly, he always speaks slowly, haltingly seems an appropriate word, yet he never stalls. His speech does not have a stutter, but his statements come in bursts, as might those of a sever asthmatic who searches for air to live through another phrase. He is absorbed by the making of history. He also holds in contempt Argentina’s short pedagogical account of his past which is studied in all its oppressive and meaningless detail and spans little more than the lifetimes of two men. Hence, perhaps, Borges’s fascination with an older past, with Nordic myth, legends without source, and kings without origin, which he transposes into the fantasies of his fiction. In Borges, memory is enriched as well as plagued by history. Borges said that once he had asked his grandmother if there was any Scots, or Irish, or Welsh ancestry in the family. He was anxious to know if he could find a link of his own with the legends that he was so attracted to. “No” she said. “No, I am just plain English … Thank goodness” Huh, there was nothing fancy about her. He tried to chase the last reluctant corn flakes about the plate, then pushed the plate away. Fanny, a robust maid, came in and asked her for a cup of coffee. She ordered him to finish those last corn flakes. He argued that he had finished, but she said that he had not. When she left the room to fetch the coffee he said, ‘She’s bossy, eh? She looks after me. She has been in this house for thirty years and now she bosses me about. She was here when my mother died. His mother had once said that she only stayed alive to be able to read to her blind son, ‘Georgie’ she called him. That was her purpose in life. A large old white cat had followed the photographer through all his movements and had watched us throughout the conversation. Now it was exhausted by the aimless voices and it dropped onto its side and closed its eyes. ‘I am fond of cats,’ Borges said as the cat tucked his foot. ‘I like black dogs, well, large dogs … Small dogs I hate. Pekingese and that kind of thing I think of as small monsters. But a cat is as beautiful as a tiger in a small way. That cat is beautiful. He eats very little … And still he is a fat cat.’ Borges laughed a muffled laughter, with pursed lips. The blare of a bus’s horn, used as an alternative to brakes in the suicidal traffic of Buenos Aires, came up through the closed window. It was a reminder of where we were. Buenos Aires had temporarily dissolved about us even if it is part of Borges and he has given the city a special meaning, which sometimes means that he is sure it has ceased to exist. The sun followed the rain. It shone onto the room’s bare floor, a blind man’s room, bared of furniture to avoid collision with unseen objects. The table was pushed close to the bookcase, there were not carpets, the standing lamp and the other chairs and the settee and the small desk and the glass cabinet were all pushed close to the walls. The room had the look of one always about to be swept by a housewife obsessed with cleaning. 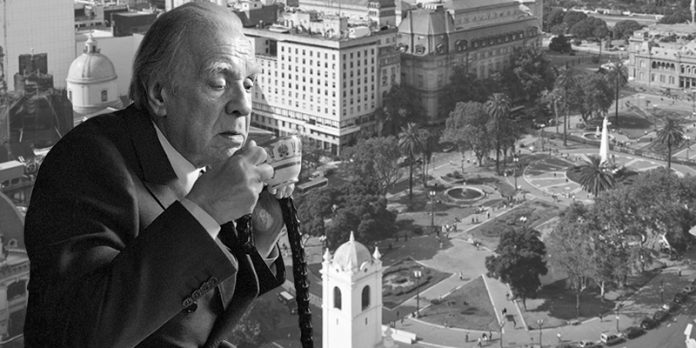 Borges had once been a feature of Buenos Aires as he walked on the arm of friend, or of a secretary, or even of a journalist who had been granted an interview, under trees and along the paved paths of Plaza San Martín or progressing slowly along calle Florida, the pedestrian shopping street ten blocks along where all of Buenos Aires goes to be seen. Buenos Aires in the conversation of Borges is a state of mind more than a place. On that city of the mind Borges has an influence as strong and as undefinable as the urban smells of cooking which are part of the making of a place. Is is a capital without a distinctive physical feature, squatting on the flat edge of the River Plate on land which is unchanging up to the Andes foothills. For many people, particularly artists and writers, the city’s charm is in its people who take the responsibility from land shapes to constitute the capital’s main feature. But he was just back from New Orleans and wanted to talk about it. ‘It was a city of jazz.. Jazz is with you all the time, wonderful jazz. Blues, spirituals, hot jazz and so on. Tango is the music of Buenos Aires, but you do not hear tango … Not as you hear jazz in New Orleans. ‘Nobody knows where tango came from … There are people in Montevideo who claim that Uruguayans evolved it. There is agreement on the date, about 1880. But here in Buenos Aires it is supposed to have begun at the corner of Lavalle and Junín. Where the main brothels were. It is the Jewish Quarter now. It is quite well known. The brothels are everywhere, but the centre of them was at Lavalle and Junín. ‘People who lived in the city of Rosario say the tango came from Rosario Norte, Sunchales, and in Montevideo from Yerbal street. All are streets which had brothels, or were linked with pimps … or whoremasters, as they were called in Old English. That is a finer word than pimp, eh? Whoremaster …’ he spat the word, enjoying the impact. ‘Pimp sounds weak … derogatory and insignificant. But whoremaster, there is a fine word. I think whoremonger was also used. ‘People in Buenos Aires are always running about. If you read the papers you get the impression of living in a frenzy. But if you talk to people I think they stand still. In fact, we all stand in need of money. The economic slump was bringing the tramps back to park benches, and perhaps the rapists too. Once, they had been shot out of the trees by trigger-happy police who took the place of child molesters and teenage abusers when they had finished molesting adolescents in the cafés under the pretext of anti-guerilla security. The molesters would find their prey in the parks again now that girls could not afford to await their friends in cafés. There are colours which Borges cannot see and which are special to Buenos Aires. One is the strange pink light of dawn that gives each morning an impression of being ahead of the hour. It is part of the city’s frenzy to live as if in another time of day. ‘When I was a boy I thought of Buenos Aires as being a tiny Paris …’ That is how every artist described the jewel on the River Plate. But it is also a mixture of many things and cannot decide which it wants to be. Buenos Aires always wants to be somewhere else. It was not a city. Lucio Vicente Lopez called it La Gran Aldea — the Big Village — in a fictional history of the capital which not many have read since leaving school but whose title has entered South American Spanish as a cliché for the village life of the quarters and sections of any big city. ‘I mean low houses … with flat roofs and with patios. There were no tall houses. The first apartment building went up near Plaza de Mayo, four or five stories hight. But most people lived in small houses, with aljibes (water wells) in the patio. People put tortoises in the cistern to purify the water. In Montevideo, they used toads instead of tortoises. He made his way across the room, from the table to the sofa refusing my offer of assistance. He wanted no arm to guide him, just words, such as ‘Left a bit …’ or ‘Right a little, and then straight …’ He dropped into one end of the settee, and briefly recalled his breakfast as satisfactory. ‘Food is still very good in this city … You can get good Italian food at any restaurant. That began in 1910. When I was a child Italian food was unknown and not it is everywhere, especially on Sundays: people always have ravioli, ñoqui … and so on. The concept of a gringo classifies people into generations. In Buenos Aires up to the Second World War it had referred to Italians. North American travellers, diplomats, self-conscious about being outsiders, assume that the word referred to all foreigners and particularly them. And throughout the continent the North American became the gringo. There was a long pause. He had wearied of the subject and lost interest in the conversation. He raised his head suddenly. ‘In wartime people go crazy … Madness is encouraged. If you are not mad you become a traitor. ‘I don’t think Anglo-Argentines like you have suffered any personal indignity. The pope have tried to keep their wits. I think the newspapers are crazier than the people … That always happens. ‘But people are torn … I keep thinking this is impossible. Have a nightmare feeling about it. A sense that this is part of the past which has caught up with use and preserved for prolongation into the future. I don’t know when I will wake up. This cannot possibly be happening. ‘And yet it is, and will go on … Everybody seems to ready to fight over something so insignificant. It is a sad time for all of us. Let us hope that the fighting will be over soon. It is not worth fighting for this, especially as our territory is so extensive, far too extensive … Most of it is desert, in the south. Of course, there are such things as honour and loyalty … which in war are very dangerous words … Honour … loyalty …’ He chuckled. Borges’s apprehension is contagious. His own fears, his talent for making events timeless, his known capacity for warning o the permanence of disturbing issues, are immediately felt. Gabriel García Marquez has also given the sense of past a foot in the future, and he admits being inspired by Borges. He said that he thought all Americans, North and South, and Europeans in exile. That would come form before the great-grandfathers who were military men making Argentina. ‘But I have little in common with the Indians , or the Incas or the Aztecs … In fact, I have nothing in common with them. Except perhaps a sort of neurosis which makes me different to the Japanese or the Chinese. ‘I think we are expatriated by low-lying Europeans. In the end, that may be all to the good. 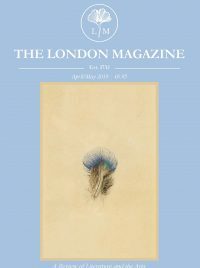 The European is apt to forget that he is European: he thinks in terms of being a Scot, or a German, or Double-Dutch … But here we try to inherit the whole of Western tradition, embracing all nations. ‘I have more Spanish blood than any other running in me … But that puts me no closer to Spain. Maybe I am closer to England , for all I know. Many people do feel that way. We Argentines have always thought of South America as something foreign to us … In the last few week we have been told that we are South America, that the continent is very near. But I have never thought of myself as Latin American. I do not think that such a thing exists. People in Peru think of themselves as Peruvians; and people in Uruguay are Orientales. I think that Latin American is a concoction created for practical purposes. I have no such internationalist sense; I think nobody has. ‘For instance: I feel closer to a man in Montevideo (Uruguay) than to one in Jujuy or Mendoza (Argentina). A. Uruguayan’s blood is the same as that somebody in Buenos Aires. ‘Even if I cannot define what the word Argentina means, I can feel it. That may be more important. His thoughts moved on again. ‘To me English literature is the literature, especially English poetry. Poetry came to me through the English language. It was all in my father’s library … He taught me to love English poetry … I did not understand it too well, but I felt it, and that too is important. As evidence of his studies he recited the Lord’s Prayer in ancient English, discovered in his Saturday meeting with fellow enthusiasts. He moved on to the Scottish writers, largely as a mark of respect to my own Scottish ancestry. ‘People come and read to me in French — I am going over Voltaire. I learned French, and Latin, when I lived in Geneva, between 1914 and 1921. I taught myself German to read Schopenhauer. One of his publisher’s agents came in. It was time for work, for correspondence with his translator into English, Norman Thomas Di Giovani, and for discussion of new editions. It was time to write a story about the Pope’s visit.